Hello, guys! I know, I know. It's been a real long while since the last time I held a giveaway on here, but here's the reason: I was saving up to giveaway something very awesome. 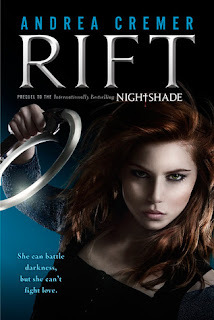 And that something that is very awesome happens to be a SIGNED copy of Rift by Andrea Cremer! This copy is given courtesy of Andrea's publicist, so I'm going to give her some special props here. And please, no cheating because that'll make me sad.